It’s cold, it’s been a long week and motivation is fading into the mists of time along with memories of our last holiday. So, to boost morale and give us that last push into the weekend we’ve delved into our video vault for some tips on how to motivate your team! 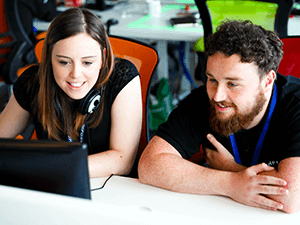 At UKFast we’re incredibly lucky that there’s a focus on our development, both personally and professionally, rather than just hitting targets. There are lots of things that keep us UKFasters moving and shaking and keeping our eyes on the prize, and it’s not all caffeine related (it’s partly caffeine related). As we heard earlier in the week from one of our lovely new tech lads, UKFast prefers to work with the carrot, rather than the stick, and as our always-energetic Director of Training and Education Aaron says, money shouldn’t be the primary incentive of what keeps you happy and motivated at work. From personal development training plans, to trips to Snowdon and Switzerland, to our recent festival UKFest (no, that’s not a caffeine-induced hallucination on my part), knowing that our workplace is willing to invest in us makes the UKFast team willing to go that extra mile for our customers; something which our NPS (customer satisfaction score) reflects. If you’re thinking that all sounds pretty great right about now, here Aaron and Arlene, our Director of People Development, share what we’ve learned about motivating your team. If you want to work at a place that has a whole arsenal of ways to keep you motivated take a look at our website.